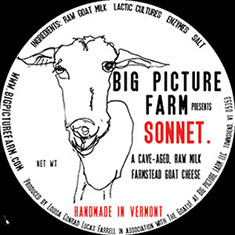 Big Picture Farm, LLC was started by husband and wife team Lucas Farrell and Louisa Conrad in 2010 in Townsend, VT. They now have 40 goats that graze their hillside farm and produce milk for their cheeses as well as their award winning goat milk caramels. The Farm is open to visitors on Sunday afternoons from 1- 3 PM. Meet our haiku. Little thoughts of cheese. Closely related to Sonnet, Haikus are one-offs that come in a variety of sizes and shapes. Earthy, rich, softly sharp with a subtle tang, this cheese is made with our goat’s delicious milk and is filled with the tastes of our hillside. Seasonally Available in limited editions. $30/lb. Sold by the pound. This years haiku is a softer, more supple version of sonnet, velvety at the round and perfectly paired with a little plum and fennel chutney. It has been getting rave reviews at market and tastings. It is very very tasty. Our tomme-style, cave-aged beauty was awarded a winner’s ribbon at the 2014 American Cheese Society competition! We hand-make Sonnet once or twice a week during the spring and summer and age it for several months here at the farm. We use exclusively milk from our own goats which ensures freshness and a seasonality to the flavor. 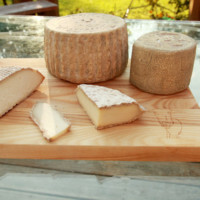 Creamy, nutty, sharp, SMOOTH — Sonnet has often been described to us as Manchego-like.